TBILISI, DFWatch–One person was arrested for witness tampering on Friday in connection with the new investigation into the Khorava Street murders. Merab Morchadze, 45, was detained under Article 372 of the Criminal Code on the basis of new evidence obtained in the course of the new investigation into the alleged murder on Khorava Street, the Ministry of Internal Affairs said in a statement posted online on the ministry webpage. Two juvenile boys were convicted last week for murdering two of their peers at a high school in Tbilisi last December. A public outcry on the background of perceived sabotage by the Prosecutor’s Office led to the MIA launching a new criminal probe into the case. A parliamentary commission was also established to look into the case. 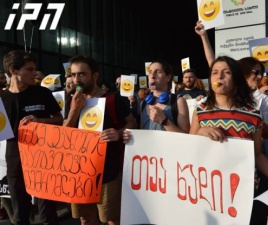 But even though the protests have subsided, Zaza Saralidze, who is father of one of the murder victims, has pledged to start a new wave of mass protests on Sunday if there are no tangible results from the new investigation by then.